Every now and then, followers of the aerospace industry read news about the relationships between Boeing and the unions. Recall the 8-week strike by the International Association of Machinists (IAM 751) in the fall of 2008, or the more recent negotiations with the Society of Professional Engineering Employees in Aerospace (SPEEA). See, for instance a recent article from Leeham News on the need for change in Washington state, “Right-to-Work, Creepy and Right-to-Worse in Washington State“. Some months ago I was intrigued by what those terms meant in the American landscape, “right-to-work”, “unionized state”, “non-unionized state”, etc. Thus, I started looking for some definitions in the Wikipedia. And I found some of these terms misleading, or at least when seen from a European frame. Open shop: “An open shop is a place of employment at which one is not required to join or financially support a union (closed shop) as a condition of hiring or continued employment”. Right-to-work: “A “right-to-work” law is a statute in the United States that prohibits union security agreements, or agreements between labor unions and employers, that govern the extent to which an established union can require employees’ membership, payment of union dues, or fees as a condition of employment, either before or after hiring. “Right-to-work” laws do not, as the short phrase might suggest, aim to provide a general guarantee of employment to people seeking work, but rather are a government regulation of the contractual agreements between employers and labor unions that prevents them from excluding non-union workers”. After I made this short review of those definitions, I got a complete different picture. Non-unionized states which I initially perceived as places with some intrinsic insecurity for the worker are simply having a similar scheme than the one we have in Europe: shop-floor workers or engineers at Airbus are not required to join any union to get employment, nor are they forced to pay dues to union if contracted, though they may join one if they deem it in their interest. I could even think of the union-states as an anachronism (forcing workers to join a union in order to work), however some of the reasons provided by opponents of the right-to-work law have sense: free-riders would benefit from a collective bargaining agreement negotiated by a union without paying for that negotiation, the weakening of unions may lead to a race to the bottom, etc. So far, I was never part of any union, thus I fall under the category of free rider, as I have and continue to benefit from social conditions negotiated by large unions. I found an interesting report prepared by the European Commission on “Industrial Relations in Europe (2010)” [PDF, 5MB]. 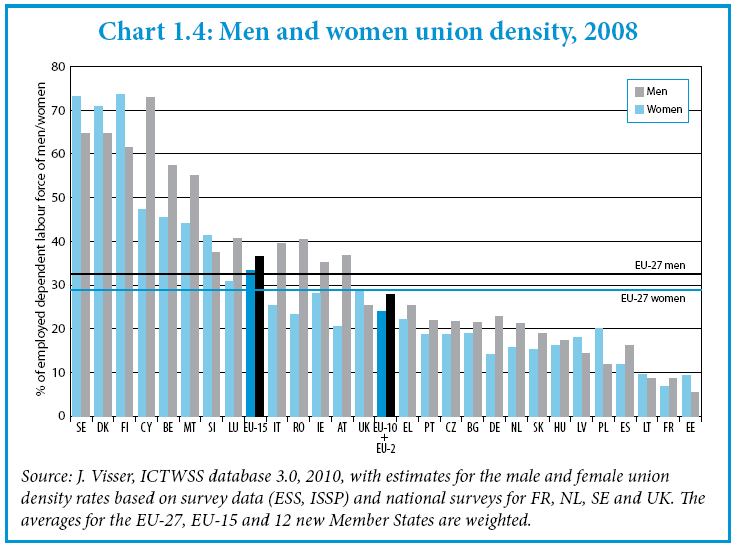 Among the many sides of labour relations covered in the report, I found the graphic below with numbers about union affiliation rates in different European countries. Union affiliation in Europe (source: European Commission). The figures in Spain and France, where I have worked so far, are around or below 10%. I found it in line with non-unionized states in the USA according to the Wikipedia: states without right-to-work laws have an affiliation generally above 10% (up to 25%) whereas states with such laws (thus similar to Spain or France) have lower figures of affiliation, less than 10% and down to 3.5% (with the main exception of Michigan).